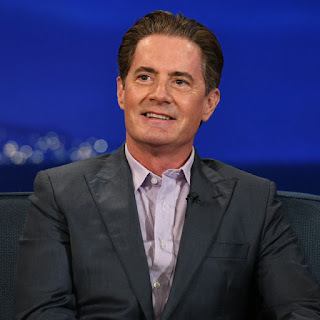 Beloved Special Agent Dale Cooper's real-world alter ego Kyle MacLachlan was interviewed this week by Conan O'Brien on the TBS Talk Show Conan and the result is a charming, fun, and touching conversation that is as interesting as it is hilarious. And check out the first time Kyle and Conan shared the small screen together in their unforgettable SNL sketch from 1990 in the clip below! First clip involves MacLachlan's fans sending him coffee art. Second clip involves MacLachlan's love of Halloween and creating a spooky environment at his home. In the third clip, Conan and Kyle reminisce over their Saturday Night Live sketch of Twin Peaks from 27 years ago, all the way back in 1990. Kyle was Agent Cooper, Chris Farley was Leo Johnson, Mike Meyers was the LMFAP, Kevin Nealon was Sheriff Truman, and Conan played Deputy Andy! Here is the Saturday Night Live skit! It is brilliant. Be sure to watch it, especially if you never have before! 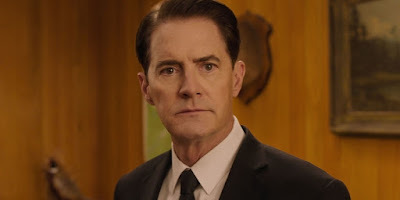 In the fourth clip, Kyle MacLachlan discusses channeling William Shatner for his characterization as the Mayor of Portlandia. And Shatner's reaction to hearing that. The fifth clip focuses on Kyle MacLachlan's return to Twin Peaks 25 years later. And Kyle says he thinks the fans writing about Twin Peaks and mentioning its window for a 25 year return probably helped inspire David Lynch and Mark Frost to re-examine the show and see if they felt inspired to continue the story a quarter century later. Thankfully they did! As the writer of an influential David Lynch blog at the time Kyle as talking about, I cannot help but feel thrilled to hear Kyle MacLachlan's genuine appreciation for all my efforts and the efforts of the rest of the David Lynch and Twin Peaks fan communities back then at about 2010-14. We are thrilled with Kyle MacLachlan's nuanced triple (perhaps quadruple) performance in Twin Peaks: The Return (2017). You can watch the full Conan episode here.